In every good piece of writing, from blogs to emails, there is a story. If you want your writing to influence your reader, that story is the Star of Bethlehem. Follow it religiously. I’ve been reading a classic text about writing by Kenneth Roman and Joel Raphaelson. It’s called: Writing that Works: How to Communicate Effectively in Business. As I read all the rules – there are so many – I began drawing little models of all the authors’ ideas in this book. Then I saw what linked them all. It is respectfully requested that you send a representative to our conference. How vividly I see the group of hopeful faces behind the second request. They don’t have to use any adjectives; their respect is in their words. But no such endearing picture springs to mind with the first entreaty. I don’t know who is making the request, for starters. The biggest mistakes we make in our writing is to use the passive voice too much. The passive voice kills the story. You can tell when you are using the passive voice because the reader does not know who is doing what to whom. That doesn’t mean you have to be simplistic. The start of Jane Austen’s Pride and Prejudice is my all-time favourite sentence. Active. Funny. Complex. Neil Patel is master of the story-in-a-call-to-action. The front page of his website, Quicksprout, asks one question: Do you want more traffic? No one ever has enough traffic. Who among us can click the ‘No’ button? Do you see the story behind each of the CTAs? Of course, the golden world of “yes” compared to the grey and gloomy “no” helps us make up our minds. With Neil’s writing, we always know who is doing what; usually it is us doing what he wants. Ann Handley is one of my favourite writers about writing and content marketing. In her book, Content Rules, she writes a whole chapter using a campfire as a metaphor for writing. With that little story, Handley paints a picture of blogging that I find irresistible. 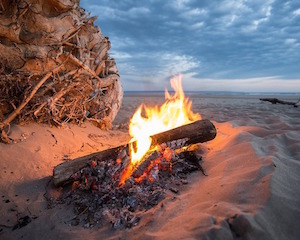 I’d love to believe that my blogs are like a campfire that warms my readers and builds camaraderie. If you sit down to write and you cannot find the words, it is because you haven’t found the story. Look for them in every word you write. Is it time to step back and reassess content marketing? Just because we are all doing content marketing doesn’t mean we should not think about whether or not it is the right strategy.